I know I haven’t been around much but I’ve been busy with wedding planning, etc. The last two weeks have been the most fun I’ve had during the entire wedding-planning process. It was shower time! The first shower was here in Bentonville and was given by my maid of honor. It was HOT! No, seriously, I mean the weather, LOL. It was an outdoor shower and it happened to be on the first day of like 105-degree heat. I’m not complaining though, it just made it even more wonderful that people still made the time to come. Some even came from TULSA! We played a game or two, including something that I don’t really consider a game. It was actually one of the coolest ideas I’ve ever seen in regards to showers. The hostess had each guest write a message to John and me and seal it in an envelope with directions of when the message is to be opened. Some messages can be opened whenever we wish, others are more well, curious. Let’s just say I’m most curious what someone wanted to tell us after the bachelor party and another person on our two-year anniversary! 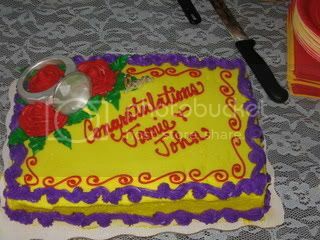 Anyways, here is the cake from that shower. I’ve got lots of pictures but thought pictures of me opening countless gifts would get old so I’m just putting in the cakes. They were all unique! This one has all three of my colors and I call it the Mardis Gras cake! Love it! The next two showers were this last weekend and both were in Wichita. The first was Friday night at my aunt’s house. It was for all the family and boy did they turn out! It was so cool to see relatives that I swear I haven’t seen in at least five years. We didn’t play games and that was fine. We just spent time talking to family and enjoying ourselves. 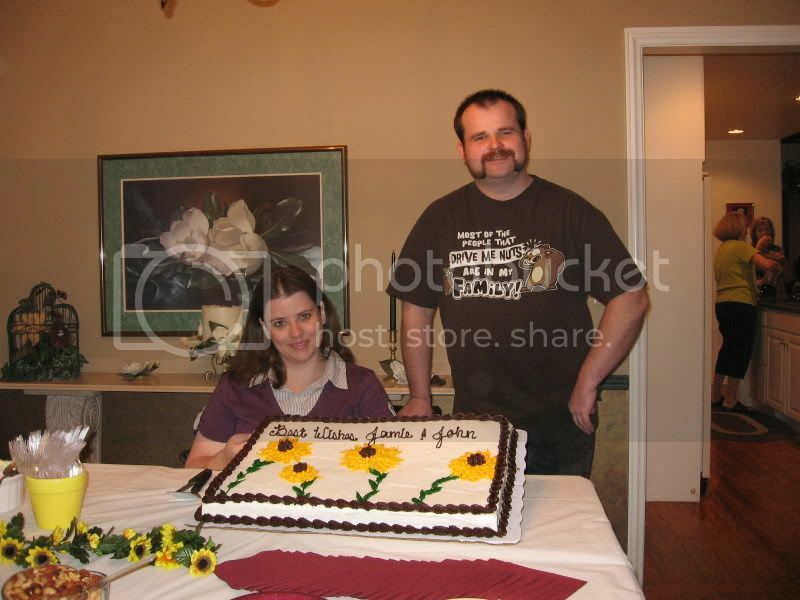 Now this cake has my favorite flower on it, which is going to be the primary flower at our wedding (if I ever figure out how to arrange the darn things). I included a shot that has both John and me in it so you can check out John’s t-shirt. Yes, that’s the man I’m going to marry LOL. I didn’t realize the impact of what he was wearing until we were halfway to Wichita! In case you can’t see it, it’s a t-shirt that says “Most of the people that drive me nuts are in my family!” Well, he wore this on purpose to a family shower … just to be funny! Fortunately my family has a sense of humor LOL. The third and final shower was at my home church and it was more like a reception. It was given by some old family friends who were more than gracious to accommodate our growing guest list! It was open house and I would guess about 40 people showed up, if not more! It was so wonderful to see people that I grew up around and some who I haven’t seen in probably 10 years. For this one I took a shot of the entire table. The cake was real simple but good. It was designed for easy cutting and had individual decorations on each piece. Well that’s our three showers. A few thoughts about all three … We did something that most couples don’t do, we had a couples shower for all three of our events! I know this sounds like I was just trying to torture John but I had a real reason for requesting this at all the showers. For one, most people (I’d say 75 percent) have not met John. There’s lots of people in my life who I care about and I wanted them to meet him. The other reason is actually because of my friends. Over the years I’ve had lots of guy friends who I wanted to include in the invitations and it seemed silly to leave them out just because they are guys. The next thing that was cool about all three was the gifts. To me the point of having these WASN’T just about getting gifts but it sure was a perk! As my family said, it’s better than Christmas because we didn’t have to share the spotlight with anyone! But we got most of the items from our registry … some items we got several times! We also got a nice assortment of gifts that weren’t on the registry and all will be cherished. The third thought I had about all three is how blessed we are to have people care that much. 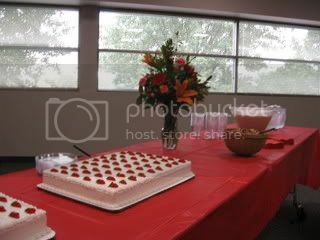 It was so wonderful that people could take time from their busy lives to come celebrate with us. The many notes in cards, kind words and other expressions of love we’ve received has been so touching. At the risk of being corny, I truly felt showered with love. How wonderful! All of my showers were couple showers too, all except one. That one was the girls from work who threw a personal shower filled with pretty things for the honeymoon! I wish all the joy and happiness this life can offer. I know you both will be very happy together!